Perhaps you’ve heard of “On Demand Computing,” also known as OD or ODC. This service is just like it sounds, providing computing resources and technology to enterprises on demand no matter where they are, so long as they have access to an Internet connection. This includes storage, software applications, and even desktop access. So what’s the advantage of ODC and why is it so popular? The quickest answer can be broken down into one word: flexibility. Offered as a subscription service, on demand computing allows users the ability to scale up or down based on their needs. This can be either short-term or long-term, depending upon the type of service you sign on for and who you contract through. This means you can scale up temporarily to cover the needs of a project or do so gradually with the growth of your business. On demand computing eliminates the need to constantly purchase, maintain, and upgrade personal servers and hardware. Instead, by subscribing to a service you pass that duty on to the data storage and cloud service company managing your on demand services. A proper company will handle all of your resources, updates, and maintenance, thus reducing your company’s costs while increasing the efficiency and dependability of your software, data, and applications. 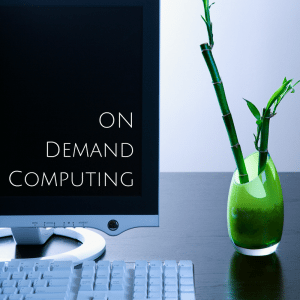 What is On Demand Computing? The cost savings immediately kicks in when companies avoid having to personally purchase software, hardware, and the employees to build and maintain them. However, the advantages stretch beyond just the financial benefits, as well as on demand computing’s scalability. With so many businesses making remote work the norm within their culture, on demand computing grants that mobility by giving users access to desktops, software, and applications from any device so long as it has an Internet connection and the user has the right credentials. With IT services and the ability to immediately add, subtract, and update user credentials with a few strokes on a keyboard, security remains stronger than ever without inhibiting mobility. This technological advancement has taken the professional realm by storm, evolving the way we do business while swiftly becoming a common resource among businesses and enterprises. Major companies such as Microsoft, IBM, and HP are just a few of the leading vendors for on demand computing services. However, many large or fast-growing businesses opt to sign onboard with data centers like Skylink, who provide these same scalable services, formidable security, and comfortable scalability while still feeling accessable. Clients find comfort in knowing that assistance with their on demand services is always just a phone call away. There is no struggle to get a hold of a real person to assist them, and no frustration of dealing with under-qualified IT service. Click here to learn more about how Skylink Data Centers sets itself apart as an on demand computing provider.